Don’t ink in your calendars just yet, or place any bets, even though the main card is set for November’s UFC 154 event. Keep your pencils handy in case the injury bug strikes again. UFC 154 takes place Nov. 17 at Montreal’s Bell Centre. The pay-per-view event features a title-unification bout between welterweight champion Georges St-Pierre (16-2 UFC) and interim titleholder Carlos Condit ( 5-1 UFC), as well as a No. 1 contender’s bout between top welterweight contenders Johny Hendricks (8-1 UFC) and Martin Kampmann (11-4 UFC). The main card settles out with middleweights Francis Carmont (3-0 UFC) vs. Tom Lawlor (4-3 UFC), light heavyweights Chad Griggs (0-1 UFC) vs. Cyrille Diabate (3-2 UFC), and featherweights Mark Hominick (3-3 UFC) vs. Pablo Garza (2-2 UFC). In addition to the PPV main card, FX and Facebook are expected to be airing the prelims. The main card was announced at today’s UFC 154 kickoff press conference in Montreal. The fall card is a big one for fans and officials of the UFC which will mark the return of welterweight champion George St-Pierre after being sidelined 19 months due to a knee injury. Watch the fun UFC 154 Preview below. 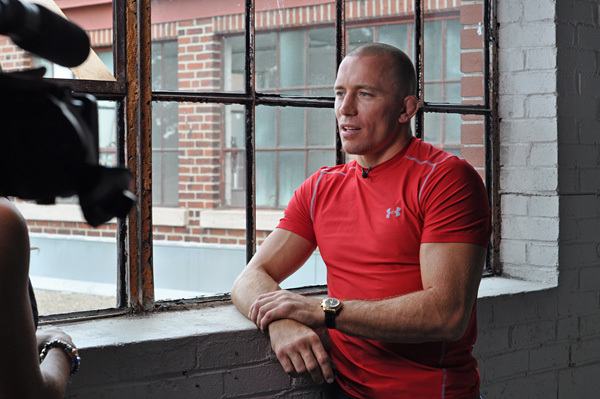 GSP is back baby! The former WEC champion, Condit, won the interim belt in February with a decision win over Nick Diaz at UFC 143 in what was a great fight. Condit opted to wait for St-Pierre rather than take another fight and risk a big-money opportunity like the one he’s earned at UFC 154. He’s won five straight and 13 of his past 14 after losing his first UFC fight via split decision to Martin Kampmann. Think you know MMA? Fantasy MMA at MMAVictor.com!